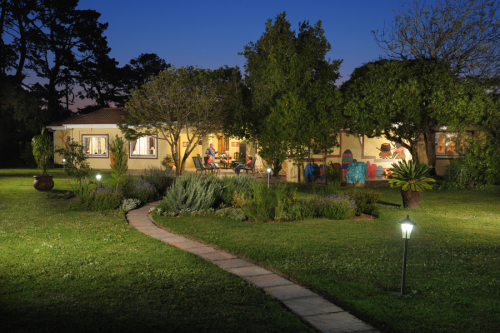 Ebubeleni Guest House offers you true South African hospitality. Choose between Bed, Bed and Breakfast, self catering (which will ensure uninterrupted peace at your private accommodation), or the hospitality of your hosts who can provide you with exquisite cuisine and a wide range of entertainment or tours designed to suit each individuals interest and needs. Our main guesthouse consists of two family units, each with two bedrooms. We have an additional three seperate single rooms. Bedrooms are all en-suite, air conditioned, with under floor heating. Each family unit has a fully equipped kitchen and lounge. The guesthouse itself is set in lush gardens, with lighted walkways leading to the entertainment area consisting of a swimming pool, fully equiped gym, games room including a full size snooker table and a licensed bar. Braais, (Barbeques), both under-cover and outside, are available to fully enjoy the pleasures of outdoor living.